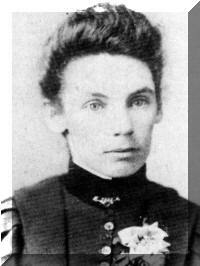 3-Emily Jane Walker was born on 16 Jan 1873 in Spring Rises, Exton and died on 15 Jul 1957 in Penguin at age 84. Emily married Ernest John Masters, son of John Masters and Mary Ann Buckland, on 4 May 1898 in Westbury, Tasmania. Ernest was born on 21 Jan 1875 in Westbury, Tasmania and died on 3 Nov 1961 at age 86. Emily Jane, the third child of Thomas and Rebecca, was born at Spring Rises and died at Penguin. In her early teens Emily had pneumatic fever which left her with a slight limp. Emily was the first daughter to marry, on the 4th May, 1898. She married Ernest John Masters in her twenty-sixth year. Thomas donated the princely sum often pounds towards the cost of Emily's trousseau, and her brother Percy, then fifteen years of age, drove the cart that took Emily and their mother to Deloraine to spend it. No doubt much sewing ensued at "Spring Rises" as both Emily and her mother were good seamstresses. Jack was a railway employee. After their marriage they lived at Springfield and Dennison Gorge in north-eastern Tasmania for 15 years, the railway was then the only means of transport into the area. Six daughters and one son were born there, and when the children were old enough to go to school, Emily would put them on the morning train for the two mile journey to Lebrina. After school they walked home along the railway track, usually arriving in tears because some of the older boys used to throw stones at them. On Sundays they all walked along the railway line to Sunday School and church at Lebrina. Jack would often go back to the evening service. In 1913, Jack purchased from Thomas a farm at South Riana which Thomas had bought in 1890 for four pounds and acre. Thomas donated land for a school. Ernie, Jack and Emily's only son, said that he did not know what his father had paid for the farm, as "father did not tell us that sort of thing". When his parents retired in 1945 to live in Penguin, Ernie paid his father 22 pounds 10 shillings an acre for it. Ernie sold the farm in 1975 for 500 dollars an acre and retired to Penguin. Emily and Jack had seven daughters, Annie, Ethel, Minnie, Maud, Florrie, Alma and Mary. Emily taught Sunday School and sewing at the local school, and loyally supported her husband in his duties as councillor and deputy warden of the Penguin Municipality and as a Methodist lay preacher. It was said that there wasn't a church in the Penguin Municipality in which he hadn't preached. Ernie, their only son, was warden of the Penguin Municipality. A road at South Riana was named after the Masters family in recognition of their service to the community. Emily was a kindly caring person, quietly in the background until needed. She became deaf as she grew older. Her son Ernie said that she was a wonderful mother, whom he hoped to meet again one day. "She always put her family first, herself last." Emily lovingly cared for by her family during her old age, died at her home in Penguin. 4-Annie Masters was born on 26 Jan 1899 in Springfield, died on 13 Nov 1982 at age 83, and was buried in Devonport. Annie married Albert Tasman Rudd, son of Robert James Rudd and Eliza Alice Amelia Spencer. Albert was born on 27 Jul 1893 in Port Frederick, died on 31 May 1966 in Devonport at age 72, and was buried in Jun 1966 in Devonport. 4-Ethel Masters was born on 17 Feb 1900 in Scottsdale and died on 26 Sep 1980 at age 80. Ethel married Wilfred George Ling, son of Francis Edwin Ling and Emily Smith, on 23 Nov 1921 in Riana South. Wilfred was born on 7 Jun 1897 in Ulverstone, Tasmania and died on 20 Oct 1967 at age 70. They had four children: Joy, Roy Wilfred, Donald Charles and June. 5-Joy Ling was born on 12 Aug 1923. Joy married her third cousin Clifton Walworth Smith, son of Thomas Walworth Smith and Hilda May Walker. Clifton was born on 5 Aug 1922. They had one daughter: Jennifer Joy. 5-Roy Wilfred Ling was born on 17 May 1926. Roy married his third cousin Rita Jean Good, daughter of Lawrence Good and Nellie Elizabeth Walker. Rita was born on 25 Oct 1932. They had four children: Wayne Wilfred, Julie Rita, Gregory Lawrence and Tony Claude. 5-Donald Charles Ling was born on 27 Mar 1933. Donald married Ruby May King, daughter of Alfred Roy King and Ada Jean Smith. Ruby was born on 2 Aug 1934. They had four children: Christine Kaye, Ivy Ruby, Kathleen Helen and Lorraine Hilda. 6-Christine Kaye Ling was born on 26 Dec 1952. Christine married Brian Eli Butler. Brian was born on 19 Jun 1951. They had three children: Mathew John, Dion Charles and Narelle Jean. 7-Mathew John Butler was born on 9 Mar 1973. 7-Dion Charles Butler was born on 9 Jan 1976. 7-Narelle Jean Butler was born on 12 Oct 1978. 6-Ivy Ruby Ling was born on 12 May 1956. Ivy married Barry Royal Bligh. Barry was born on 28 Apr 1943. They had three children: Rachel Marie, Nigel Stanley and Shane Barry. 7-Rachel Marie Bligh was born on 11 Feb 1978. 7-Nigel Stanley Bligh was born on 11 Feb 1978. 7-Shane Barry Bligh was born on 22 Jul 1981. 6-Kathleen Helen Ling was born on 16 Jul 1960. Kathleen married Barry James Guard. Barry was born on 22 Oct 1954. They had two children: Shawn James and Kellie. 7-Shawn James Guard was born on 5 Sep 1980. 7-Kellie Guard was born on 1 Feb 1983. 6-Lorraine Hilda Ling was born on 31 Oct 1961. Lorraine married William Hall. William was born in Jun 1961. 5-June Ling was born on 18 Jun 1938. June married Don Brooks. Don was born on 23 May 1932 and died on 21 Dec 1974 at age 42. They had five children: Trevor Donald, Ian, Dianne June, Craig and Annette. 6-Trevor Donald Brooks was born on 9 Jun 1959. Trevor married Helen May Wise, daughter of Derek Upchurch Wise and Molly May Walker. Helen was born on 30 Apr 1961. 6-Ian Brooks was born on 3 Aug 1960 and died on 22 Nov 1961 at age 1. 6-Dianne June Brooks was born on 7 Jul 1962. Dianne married David Roy Lowrie. David was born on 2 Jan 1961. They had two children: Jason David and Trent Roy. 7-Jason David Lowrie was born on 3 Sep 1978. 7-Trent Roy Lowrie was born on 26 Jul 1980. Dianne next married Richard Viney. Richard was born on 8 Aug 1958. They had one daughter: Alycia June. 7-Alycia June Viney was born on 4 Sep 1987. 6-Craig Brooks was born on 20 Aug 1963. Craig married Pam Stonehouse. Pam was born on 9 Mar 1963. 6-Annette Brooks was born on 9 Jul 1966. Annette married Craig Lewtas. Craig was born on 19 Mar 1962. They had one son: Joshua Donald. 7-Joshua Donald Lewtas was born on 15 Aug 1987. June next married Brian Galpin. Brian was born on 16 Jul 1938. 4-Minnie Masters was born on 11 Jan 1901 in Lietinna, Tasmania and died on 14 Nov 1975 at age 74. Minnie married Curtis Rundle Ling, son of William Ling and Emma Cowley. Curtis was born on 17 Dec 1892 in Ulverstone, Tasmania, died in Jan 1971 at age 78, and was buried on 19 Jan 1971 in Devonport. He served in the First World War. 4-Maud Masters was born on 8 Mar 1902. 4-Florrie Masters was born on 24 Oct 1903 in Lebrina, Tasmania. Florrie married Oscar George Barnes, son of Charles Barnes and Caroline Sushames. Oscar was born on 25 Nov 1894 in Ulverstone, Tasmania and died on 22 Jun 1978 at age 83. They had one son: John. 5-John Barnes was born on 9 Nov 1943. John married Gaye Halborn. Gaye was born on 5 Oct 1944. They had two children: Amanda and Rachel. 6-Amanda Barnes was born on 7 Apr 1971. 6-Rachel Barnes was born on 7 May 1981. 4-Ernest Masters was born on 20 Mar 1906 in Lebrina, Tasmania and died on 24 Apr 1988 at age 82. Ernest married Alma Etheleen Barker, daughter of John Jacob Robert Barker and Lucy Anne Fielding, on 5 Oct 1927 in St. Stephens Church, Penguin. Alma was born on 3 Apr 1910 in Riana. They had three children: Jack, Kath and William. 5-Jack Masters was born on 13 Apr 1928. Jack married Jessica Graham. Jessica was born on 6 Aug 1930. They had two children: James and Elizabeth. 6-James Masters was born on 3 Feb 1958. James married Leonie Brown. They had two children: Jennifer Audrey and Timothy. 7-Jennifer Audrey Masters was born in Aug 1983. 6-Elizabeth Masters was born on 25 Feb 1968. Elizabeth married Garry Kenneth Stafford. Garry was born on 3 May 1963. 5-Kath Masters was born on 11 Jun 1932. Kath married Geoff Johns. Geoff was born on 11 Apr 1929 and died on 28 Feb 1975 at age 45. They had four children: Alan, Garry, Stephen and Nicole. 6-Alan Johns was born on 22 Jul 1951 and died on 29 Aug 1974 at age 23. 6-Garry Johns was born on 16 Jun 1953. Garry married Gwen Gerrard. They had two children: Robert and Ben. 7-Robert Johns was born on 11 Feb 1978. 7-Ben Johns was born on 3 Apr 1981. 6-Stephen Johns was born on 5 Jun 1958. Stephen married Helen McFie. Helen was born on 22 Dec 1962. They had two children: Kristie and Colin. 7-Kristie Johns was born on 9 Jan 1981. 7-Colin Johns was born on 28 Feb 1983. 6-Nicole Johns was born on 8 Jan 1963. Nicole married Mark Porter. Mark was born on 3 Jan 1958. Kath next married Desmond Phillip Belbin, son of Bertie William Belbin and Pansy Grace Appleby. Desmond was born on 10 Aug 1925. He served in the Second World War. 5-William Masters was born on 22 Jun 1938. William married Val Cole. Val was born on 16 Aug 1941. They had three children: Sharon, Brett and Scott. 6-Sharon Masters was born on 25 Sep 1960. Sharon married Bevan Cooley. They had two children: Danielle and Clinton. 7-Danielle Cooley was born on 4 Mar 1980. 7-Clinton Cooley was born on 9 Jan 1983. 6-Brett Masters was born on 11 Nov 1962. 6-Scott Masters was born on 6 May 1971. William next married Alicia. They had one daughter: Lillith. 6-Lillith Masters was born in Aug 1982. 4-Alma Masters was born on 22 Jul 1912 in Dennison Gorge. Alma married Edward Frederick Fielding, son of Frederick Percy J. Fielding and Alice Groom. Edward was born on 28 Oct 1910 in Pine Road, near Penguin and died on 24 Jul 1977 at age 66. They had eight children: Max Frederick, Gwenneth Alma, Allan Ernest, Barry Colin, Robert Bruce, Douglas John, Maurice Ralph and Kevin Geoffrey. 5-Max Frederick Fielding was born on 24 Sep 1935. Max married Betty Loretta Russell. Betty was born on 21 May 1936. They had four children: Gerald Frederick, Desmond Max, Laurence Donald and Annette Gaye. 6-Gerald Frederick Fielding was born on 7 Nov 1954 and died on 3 Feb 1979 at age 24. Gerald married Kym Taylor. 6-Desmond Max Fielding was born on 25 Dec 1956. Desmond married Valerie Purton. Valerie was born on 13 Jul 1957. They had two children: Mathew Leigh and Olivia Marie. 7-Mathew Leigh Fielding was born on 1 Jan 1978. Mathew married Olivia Marie Fielding, daughter of Desmond Max Fielding and Valerie Purton. Olivia was born on 27 May 1980. 7-Olivia Marie Fielding was born on 27 May 1980. Olivia married Mathew Leigh Fielding, son of Desmond Max Fielding and Valerie Purton. Mathew was born on 1 Jan 1978. 6-Laurence Donald Fielding was born on 23 Apr 1957. Laurence married Tracey Deana Doherty. Tracey was born on 4 Feb 1961. 6-Annette Gaye Fielding was born on 3 Jul 1961. Annette married Garyy Earnest Carr. Garyy was born on 2 Dec 1954. They had two children: Janine Anne and Jason Gary. 7-Janine Anne Carr was born on 3 Jun 1980. 7-Jason Gary Carr was born on 5 Apr 1982. 5-Gwenneth Alma Fielding was born on 11 Jan 1938. Gwenneth married Geoffrey Horace Brown. Geoffrey was born on 28 Dec 1939 and died on 25 Jun 1964 at age 24. They had four children: Judith Alma, Ronald Geoff, Mervyn William and Bruce Allan. 6-Judith Alma Brown was born on 19 Jul 1958. Judith married Royce Gardner. They had one son: Dylan. 7-Dylan Mitcham was born on 4 Jul 1987. Judith next married Michael Mitcham. 6-Ronald Geoff Brown was born on 24 Nov 1959. Ronald married Anne Shepherd. Anne was born on 24 Jul 1960. 6-Mervyn William Brown was born on 21 Mar 1962. Mervyn married Karen Mavis O'Brien. Karen was born on 19 Feb 1963. They had one son: Christopher Geoffrey. 7-Christopher Geoffrey Brown was born on 18 Mar 1983. 6-Bruce Allan Brown was born on 8 Aug 1963. Gwenneth next married Robert Crawford. Robert was born on 13 Sep 1922. 5-Allan Ernest Fielding was born on 1 Apr 1939 and died on 5 Nov 1986 at age 47. Allan married Valerie Anne Yaxley. Valerie was born on 6 Jan 1940. They had three children: Rodney Allan, Deborah Anne and Mandy Sue. 6-Rodney Allan Fielding was born on 19 Oct 1960. Rodney married Debbie Licht. Debbie was born on 6 Jan 1964. They had three children: Daniel Alan, Jarrod William and Justin Rodney. 7-Daniel Alan Fielding was born on 29 Jan 1983. 7-Jarrod William Fielding was born on 1 Oct 1984. 7-Justin Rodney Fielding was born on 19 Mar 1987. 6-Deborah Anne Fielding was born on 5 Apr 1962. Deborah married Peter Butcher. Peter was born on 19 Dec 1959. They had one daughter: Alana Kate. 7-Alana Kate Butcher was born on 19 Apr 1987. 6-Mandy Sue Fielding was born on 18 Jun 1966. Mandy married Kerry Stubbs. Kerry was born on 13 Nov 1965. 5-Barry Colin Fielding was born on 27 Apr 1941. Barry married Merlene Francis Best, daughter of George Best and Mavis Good. Merlene was born on 12 Oct 1943. They had two children: Kaye Mavis and Warren John. 6-Kaye Mavis Fielding was born on 14 May 1960. 6-Warren John Fielding was born on 26 Sep 1962. Warren married Debbie Maree Smith, daughter of Noel Alexander Smith and Marion Sharman. Debbie was born on 4 Mar 1967. 5-Robert Bruce Fielding was born on 4 May 1945. Robert married Denise Maureen Revlin. Denise was born on 10 Apr 1945. They had four children: Darren Bruce, Stephen Garth, Roslyn Maureen and Michael John. 6-Darren Bruce Fielding was born on 20 Jan 1970. 6-Stephen Garth Fielding was born on 9 Oct 1972. 6-Roslyn Maureen Fielding was born on 30 May 1974. 6-Michael John Fielding was born on 7 Aug 1977. 5-Douglas John Fielding was born on 29 Dec 1948. Douglas married Christine Joan French. Christine was born on 6 Apr 1950. They had four children: Katrina Louise, Rosmary Marie, Nigel John and Ricky James. 6-Katrina Louise Fielding was born on 16 Aug 1972. 6-Rosmary Marie Fielding was born on 15 Sep 1973. 6-Nigel John Fielding was born on 24 Jun 1975. 6-Ricky James Fielding was born on 8 May 1977. 5-Maurice Ralph Fielding was born on 27 Dec 1954. Maurice married Heather Dawn Pyke. Heather was born on 13 Jan 1954. They had two children: Brian Maurice and Tony Ralph. 6-Brian Maurice Fielding was born on 12 Apr 1977. 6-Tony Ralph Fielding was born on 11 May 1979. 5-Kevin Geoffrey Fielding was born on 11 Nov 1957. Kevin married Sandre Doreen Jansen. Sandre was born on 22 Jun 1961. They had two children: Mark Robert and Kim Louise. 6-Mark Robert Fielding was born on 13 Sep 1980. 6-Kim Louise Fielding was born on 14 Mar 1983. 4-Mary Masters was born on 14 Jan 1919. Mary married George Kenneth Corbett, son of George Michael Corbett and May Eleanor Beatrice Norris. George was born on 18 Jun 1915 in Penguin. They had three children: Dudley, Valerie and Bruce. 5-Dudley Corbett was born on 4 Feb 1943. Dudley married Dorothy Viney. Dorothy was born on 6 Jan 1943. They had five children: Debbie, Dudley, Dayle, Dianne and Duane. 6-Debbie Corbett was born on 25 Jan 1963. Debbie married Graham Dodd. Graham was born on 13 Jan 1963. They had one daughter: Angela. 7-Angela Dodd was born on 11 Jan 1987. 6-Dudley Corbett was born on 3 Nov 1965. 6-Dayle Corbett was born on 5 Oct 1967. 6-Dianne Corbett was born on 11 Feb 1977. 6-Duane Corbett was born on 11 Feb 1977. 5-Valerie Corbett was born on 19 Jul 1945. Valerie married Athol McNeair. Athol was born on 24 Mar 1944. They had three children: Annette, Sharon and Glen. 6-Annette McNeair was born on 1 Feb 1966. 6-Sharon McNeair was born on 11 Jan 1969. 6-Glen McNeair was born on 30 Nov 1972. 5-Bruce Corbett was born on 27 Oct 1947. Bruce married Dorothy Emmerton. Dorothy was born on 16 Oct 1948. They had two children: Adam and Alison. 6-Adam Corbett was born on 23 Nov 1973. 6-Alison Corbett was born on 22 Jan 1976.